Shorts on the Line - so much more! 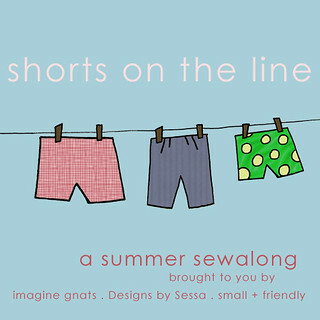 imagine gnats, Designs by Sessa, and small + friendly are the fantastic hosts for this summer sewalong. For the first three weeks in July, they are sharing guest posts with shorts inspiration, tutorials, and pattern reviews. Those sewing along at home will have a chance to be featured in the sewalong round-up posts the last week of July.... and some *great* prizes, including fabric, patterns, and gift certificates! The full sponsor list and guest judge line-up can be found here. You can also join the shorts on a line flickr group and check out the shorts on the line pinterest board for some short-y inspiration.